To be classified as a disaster, an accident or explosion at a mine has to claim at least ten lives. WISHAW, Scotland. 13th. August, 1849. The pit was the property of Mr. Wilson and the explosion occurred at the No.6 Pit. Some men had descended and a but thirty were waiting at the surface to go down when the explosion occurred. Nine were killed and one man was blow up the shaft and it was reported that fragments of human flesh and bone were scattered for 400 yards round the pit. The unfortunate man was Alexander McKimmin of Tirlee. A boy named Thomas Hunter was heard calling up the shaft to be taken up but it was 5 p.m. on Monday when it was possible to get down and Hunter’s body was recovered. The Glasgow Herald reported on 20th Aug 1849 “An alarming and destructive explosion and fire damp took place at Mr Wilson's No. 6 pit, Wishaw Colliery, on Monday the 13th inst., at half-past 5 am by which nine lives were lost. When he died in 1870 The Airdrie and Coatbridge Advertiser noted "he had been connected with the Coatbridge district for 25 years, and his kindness and benevolence made his life a blessing to many and his death a public calamity. He was upwards of 25 years general manager over the Dundyvan Coal Works and for some time now has owned Nos 1 and 2 coal pits, Souterhouse. He was a respected member and manager in the UP Church Coatbridge and chairman of the Building Committee for the church now in course of erection, where his valuable services will, as in many other schemes, be much missed." 1st The lease is to be for Five years from Whitsunday Eighteen hundred and Sixty nine with break in our favour at the end of the Second year upon giving notices to you in writing at the previous term of Martinmas of our intention to give up the Colliery, and the rent to after mentioned is not to become current until the term of Martinmas Eighteen hundred and Sixty-nine. 2nd The fixed rent is to be Two Hundred and Fifty pounds per Annum which rent shall be payable half yearly on the usual terms with interest at each terms payment from the time it becomes due until payment at the rate of five per cent per annum or in your option a Lordship to be paid to you and the same has been freed of dross by a riddle one inch in the mesh or a screen 7/8ths between the bars. 4th We are to have the use of the Machinery in so far as required by us and to be at liberty jointly with you to sell off what may not be require, the money thereby received falling to be applied to reduce the purchase money according to respective shares. 7th We are to have liberty of access to the lands of Souterhouse by the road leading to Whifflet Parish Road. Also to continue said road along the March of Souterhouse with Whifflet Lands to Number Two pit, we paying all surface damages, also to use line of Railway therefrom to Number One Pit to supply dross there. Further in the event of your purchasing the ground to Wilsons situated on the south of the Caledonian Whifflet branch, we shall have liberty to form a railway on the west thereof to the Caledonian Branch and to connect the Railway presently on the land of Souterhouse therewith and to have right to the use of the said lines of Railway on Souterhouse of the Pits. On 6.10.1869, John and Robert Gillon signed an inventory for £9,691 related to machinery at the Souterhouse Pit, including beam winding engine, pumping engine, boilers, pithead frames, signal cords, cast iron plates, handsaws, axes, lamps and other tools and sleepers, chains and rail on the railway line. It was a major financial commitment for John Gillon. John Gillon did not live long after taking on the lease. He died the following year on 25thOct 1870 at Langloan Coatbridge. The Aidrie and Coatbridge Advertiser of 29th Oct 1870 reported a "Melancholy and Fatal Accident. A serious accident occurred at Coatbridge on Tuesday afternoon, resulting in the death of a most respected gentleman, Mr John Gillon, coalmaster, Coats Cottage, Dundyvan. The accident occurred at the tunnel leading from Stone Bow, Dundyvan, to Mr Gillon's coal pits, Nos 1 and 2, Souter House. The tunnel is very narrow, having only sufficient breadth to allow an ordinary coal wagon to pass, and in consequence small wagons were employed to convey the coal through the tunnel to the North British Ironworks. It appears that upon the occasion Mr Gillon was superintending the removal of one of these small wagons and one of the ordinary coal trucks, the smaller wagon being placed first. There is a slight incline towards the mouth of the tunnel, which necessitates the application of a break, to prevent the wagons from striking the horses' legs, but when the tunnel is entered, the break is taken off. It was in thus relieving the break on the small wagon that Mr Gillon was caught between the larger wagon and the stonework of the tunnel and crushed round and round until it passed by. So quickly had the whole thing occurred that the driver, John McKillop was not aware of the fearful position that Mr Gillon was placed in, until observing him lying upon the rails, he ran forward to learn what was the matter. Mr Gillon was able to tell him the whole circumstances and indeed until a quarter of an hour before his death had remained quite sensible. Dr Charles Adam and Dr Allan were immediately summonsed, but so serious were his injuries that neither they nor Dr Wilson, who followed soon after, were able to afford any relief. Mr Gillon's death had caused general regret." James and John Seddon were charged at Glasgow County Court with culpable homicide. 1880. Seaham Colliery explosion and fire, 164 men lost their lives. After a number of prototype designs both in this country and abroad, the honour of designing the first self-contained breathing apparatus, which was of any practical use, went to Henry A. Fleuss who produced a compressed oxygen apparatus which was the forerunner of the present day "Proto" apparatus. This apparatus was used successfully in the aftermath of the Seaham Colliery explosion and fire in 1880 when 164 men lost their lives. However, little further progress was made for some considerable time, because it was realised that a breathing apparatus was of relatively little benefit in an emergency without trained men to use it and that men could not be effectively trained unless there were suitable places to carry out the training and maintain and service the apparatus. Trained instructors were also required to give the necessary instruction. 1882 7th November, Parkhouse Colliery, Catty Pit as it was better known. Explosion, 45 lives lost. An explosion of firedamp at this pit killed 45 men and boys. One of the countries worst disasters. At the inquest the 14 strong jury did not include a single miner, but comprised of gentlemen farmers, grocers and a couple of employed craftsmen. Only the flunkies were working as the pit was on short time. Gaffer Dunn lost two sons and several relations. In 1893, a William Dunn was killed at work and the CXC, "agreed to make a gratuity of £15 to his widow, he being an underviewer whilst on duty, but no precedent be thereby established"
October 16th 1889, 64 miners at Mossfield Colliery became a statistics. The colliery was situated in Adderley Green near Longton and was worked by means of two shafts 15 yards apart each 10' 6" in diameter. The shafts were 440 yards deep. The ventilation of the colliery was produced by a Waddell fan 30 feet in diameter, placed near the top of the upcast BUT was interfered with by the movement of the cages which occupied one third of the area of each shaft and during every alternate journey the cages moved rapidly against the air current in both shafts at the same time. Shaft accident, cage collided with girders in ascent. 1908, 18th August, Maypole, Wigan, Lancashire 76 killed. Shortly after the opening of the rescue station at Howe Bridge, the first call was to assist at Maypole Colliery near Wigan, where 76 lives were lost. This was the first recorded use of breathing apparatus in Lancashire and one of the first in the country. At that time, there were only six trained men and a limited number of apparatus at the station. Following the incident a special medal was struck by the coal owners and each of the six men was presented with one. 1910, 21st December, Pretoria Pit at Westhoughton, Lancashire 344 killed. Howe Bridge Rescue Station's second call out came two years after the Maypole Colliery disaster. In 1910, they were called to the Pretoria Pit at Westhoughton where 344 men and boys were killed in an explosion. There was evidence at that time of the considerably improved "Proto" apparatus. Again, a medal was struck and awarded to certain of the rescue men. This was the first time that several hundred rescue men took part in an operation, thus emphasising the tremendous progress which had been made in such a short time. 1927, 13th December, Haig Pit, Whitehaven, Cumberland No.2. 4 killed. The following information comes from The Haig Colliery Mining Museum. The explosion at Haig Pit occurred at 10.15pm during the shift change. The afternoon shift of 340 men had just left the workings. The 189 men on night shift were riding into their work place in tubs. Had the explosion occurred fifteen minutes later, many men would have been working in the location of the blast, and would certainly have been killed. The rescue brigades were summoned from all four Whitehaven pits and also from Brigham. On arrival at the seat of the explosion, 2.1/2 miles under the sea, they found that there had been extensive falls of the roof. 189 men were riding to work on the night of the explosion when they were hit by a great blast of air and enveloped in blinding clouds of dust. Choking and gasping, the men had to make their own way back to the pit bottom, and safety. Later a fire was discovered in No.3 District, 30 to 40 yards up No.1 Dilly. This gradually assumed serious proportions and despite many hours of heroic and exhausting work, the rescue party failed to get it under control. It was reluctantly decided to abandon the search for the missing man and seal up the district in an attempt to starve the fire of oxygen. 931, 29th January, Haig Pit, Whitehaven, Cumberland No.4. 27 killed. For the fourth time in nine years, an explosion ripped through No.3 North District. This area adjoins development District, which then and now, remains sealed with a 12 foot thick stopping entombing the men killed in the 1927/8 disaster. At the time of the explosion, 8.15 pm, 169 men were underground at Haig, 45 of these were in the No.3 North District. The seat of the explosion was at Baileys Place. The explosion, which occurred without warning, was of such a violent nature, that its effect could be felt over a mile away. "Meco" breathing apparatus which allowed them to enter the worse areas and quickly restore the ventilation systems, which rendered the area safe and reduced the likelihood of an outbreak of fire. 1947, 15th August, William Pit, Whitehaven, Cumberland 104 killed. At approximately 5.40 PM, on Friday, an explosion, at No.2 dip face occurred in William Pit. 117 men were in the pit at the time. The first intimation on the surface, that something untoward had happened underground, was the continuous ringing of the bell in the winding engine room showing that the lines had been crossed. Rescue operations were immediately organised and the news spread like wildfire through the town, causing relatives and friends to flock in scores to the pithead. Within an hour, 2000 people lined the narrow lane leading to the pit. Large falls blocked the main roadway and return airway. 107 men were trapped behind the falls in No.2 South District. The rescuers were organised by the Brigham Rescue Station. At 7.20 am Saturday morning, the first body of a young miner was brought back to the surface, soon there were lots more bodies being carried to the temporary mortuary. By now the crowd had been waiting over 20 hours for better news. Underground however, rescue workers were astounded as three men came scrambling over the falls towards them. At first they thought they were members of the rescue party who had worked their way around by the return airway, but once they realised that they were survivors, they gave a great cheer and assisted them out to the shaft. By late Sunday night, 90 bodies had been located, and 64 had been brought to the surface. The rescuers workers toiled all day Monday and by nightfall, a further eight bodies had been found. The squads were joined by teams from Durham, Northumberland, Scotland, and Lancashire. At about midnight the RAF School for Police Dogs from Gloucestershire arrived. The dogs were taken underground at 2 am to search for the remaining four bodies. Although unsettled by the surroundings, the dogs showed interest in one of the falls. It was not until Saturday 23rd August that the last of the bodies was brought to the surface. A final call went out for volunteers to dig graves when it was realised that the grave diggers at the local cemeteries could not possibly cope. 1949 Lyme Colliery in Lancashire. Explosion 2 members of the Boothstown Rescue Station killed. Following an explosion at Lyme Colliery in Lancashire in 1949, two members of the Boothstown Rescue Station lost their lives due to carbon monoxide poisoning. The men were working in a high temperature and collapsed due to heat exhaustion, which caused them to lose control of their apparatus mouthpiece. Recognition was given to the six permanent Corps members for their conduct during this operation by the award of one George Medal, one BEM and four King's Commendations for brave conduct. Two of the awards were posthumous. These were only a few of the many awards which have gone to rescue men for bravery during the history of the service. The two who lost their lives were two of a sizeable number who have lost their lives in rescue work. 1951, 29 May, Easington Disaster. 83 killed, including 2 rescue men. 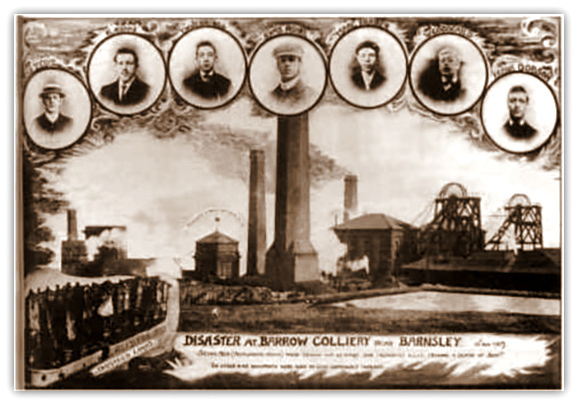 Easington Colliery, was one of the most modern and productive mines in Europe but at 4.20am the picks of the coal cutting machine cutter, which was working in the Duck Bill district of the Five Quarter seam, struck pyrites causing sparks which ignited firedamp causing an explosion which brought down 120 yards of roof and entombed 81 men. The explosion took place 900 feet below ground. 38 men were coming to the end of their shift and were to be replaced by 43 men who were working the fore-shift. The cause of the explosion was the ignition of firedamp triggered by the picks of a coal cutting machine, operating on a retreating longwall face, when they struck pyrites. The explosion spread through 16,000 yards of roadway and caused the deaths of 81 persons. Two persons died in the ensuing rescue operations. The Inquiry was opened at the Easington Colliery Welfare Hall, Easington, on 30th October and terminated on 15th November. Evidence was taken on 13 days and 75 witnesses were examined. The death toll rose when two rescue men were killed, taking the death toll to 83. They were Henry Burdess, 43, a Deputy, from Brancepeth Colliery, and John Wallace, 26, Back Overman, both were overcome by noxious gas.